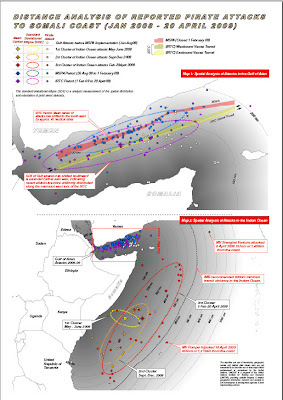 This report contains a detailed spatial analysis of the dramatic upsurge of pirate activity in 2009, focusing on changes in attack locations within the Gulf of Aden, changes in the attack success rate by month as well as on the unprecedented expansion of attacks in the Indian Ocean. Worth noting that the movement further off the Somali coast has expanded. There's another rather good map accompanying a BBC report about the planned deployment of a Dutch submarine to the Indian Ocean to hunt pirates. 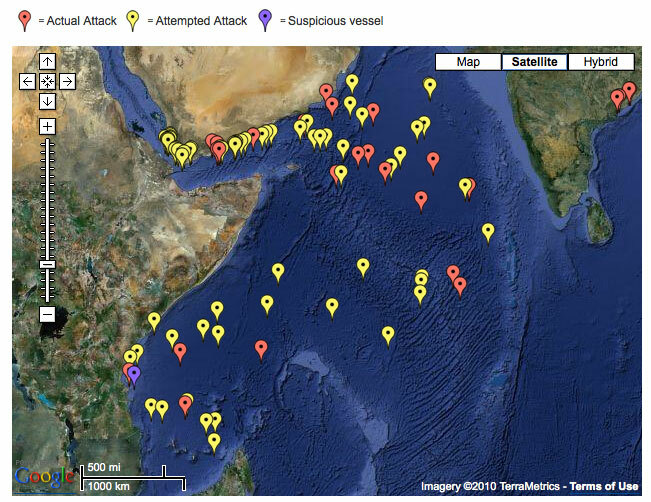 Although, I had thought some of the attacks in the Indian Ocean had occurred further eastwards towards the Indian subcontinent (than what has been depicted on that map). 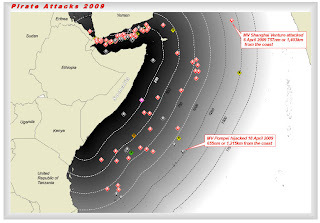 Anyhow, the map is placed at the bottom of the article.